At the dawn of this millennium Dravida Peravai , the political party wedded to Periyarism-Annaism emerges as a front runner to uphold the legacy of the Dravidian movement. The agenda and actions of this year i.e. 2000 AD will speak for itself . On the very first day of January 1 of 2000, 1856 cargo handling labourers and 64 staff were made Government Staff under Tuticurin Port Trust, in culmination of 18 year long demand. This was possible because Ministry of Surface Transport headed by Comrade Nitish Kumar Vide Notification no: PT-18011/3/98/PT had nominated N.Nandhivarman, V.V.D.Brammanandham, P.Kathirvel and Anton Gomez as Trustees of Tutucurin Port Trust. Immediately N.Nandhivarman took up the matter with the NDA led Union Government through NDA Convenor Comrade George Fernandes. Meanwhile Nitish Kumar was replaced by Rajnath Singh as Minister of Surface Transport. 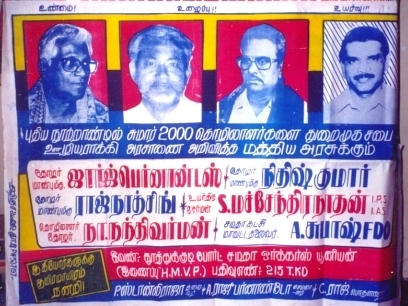 Yet 2000 Labourers were made Government staff with effect from 1.1.2000 and the above poster is a thanksgiving poster. 30.1.2000: JUNIOR VIKATAN, the leading Tamil bi-weekly in a report titled DELHI BEATS : PONDY WEEPS highlighted the interview given by Dravida Peravai General Secretary. 30.1.2000: In a seminar organized by the PONDICHERRY INSTITUTE OF LINGUISTICS AND CULTURE, Dravida Peravai General Secretary N.Nandhivarman presented a paper on the ENVIRO-HISTORY OF PONDICHERRY, which forewarns about the ecological disasters ahead for Tamil Nadu and Pondicherry. TO CONTINUE OR QUIT POLITICS ?